Yellow fever is a viral disease that causes huge epidemics in Africa and the Americas. It is mentioned in historical documents dating back 400 years. The disease is caused by the yellow fever virus or amaril virus which belongs to the Flavivirusgroup. There are two different genetic types (topotypes) in Africa, one in East Africa and one in West Africa. There are also two different types in South America although only one of these has been found to be responsible for epidemics, since 1974. 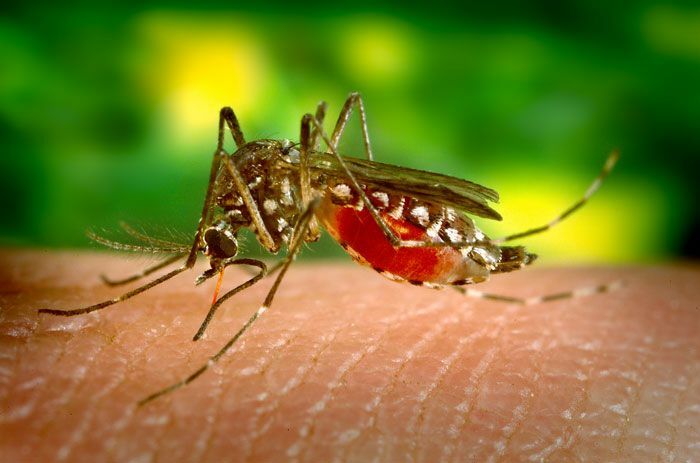 The virus is transmitted to human beings by a vector, mosquitoes belonging to the Aedes, Haemagogus and Sabethes genera . The clinical features of infection may range from mild symptoms to a serious potentially fatal disease. The term " yellow" is explained by the icterus (" jaundice") which is seen in some patients. The virus remains silent over an incubation period of three to six days. The disease then progresses in two phases. Although some patients do not develop any symptoms the first or " acute" phase particularly involves fever, muscle pain (particularly in the back), headaches, chills, anorexia, nausea and vomiting. The high fever is often paradoxically associated with a slow pulse. Most patients improve after 3 to 4 days and symptoms disappear. However, the disease then enters a " toxic " phase over 24 hours in 15% of patients. The fever recurs and several systems are affected. The patient rapidly becomes jaundice and develops abdominal pain and vomiting. Haemorrhage may occur from the mouth, nose, eyes and stomach. Blood is found in vomit and faeces at this stage. Renal function deteriorates and may progress to proteinuria (albuminuria) or complete renal failure with anuria. Half of the patients die in the toxic phase after ten to fourteen days. The others recover without significant organic complications. Yellow fever is difficult to recognise particularly in the initial stages. It can be easily be confused with malaria, typhoid fever, rickettsioses, haemorrhagic viral fevers (such as Lassa fever), arboviroses (such as dengue fever), leptospiroses, viral hepatitis or poisoning (for example, by carbon tetrachloride). Laboratory tests are needed to confirm suspicious cases. Serology can detect antibodies produced in response to infection with the amaril virus. Several other methods are used to identify the virus itself in samples of blood or post-mortem liver tissue. These tests require highly qualified laboratory staff and specialist equipment and supplies. There are no specific treatments for yellow fever although the symptoms can be treated. Although an effective vaccine is available the number of people infected has increased over the last twenty years and yellow fever is again a serious public health problem.